So now you have selected your new countertops or faucets. What's the next step? There are many places to purchase a new faucet from. Whether it is price or selection that is the driving force in the decision you should remember if you supply the faucet only the labor is warranted. If the plumbing contractor supplies the faucet they have to warranty the product and the labor, so that is definitely the better deal. There are so many faucet manufacturers that we have attached links to just a few for your convenience. 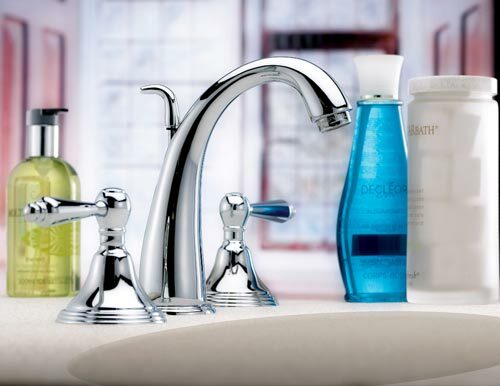 There are a few things to keep in mind when purchasing a new faucet: style, finish and warranty are the top three. The faucet is not only a practical element of the home; it can also be decorative. Some are plain and functional and others are very elaborate with crystals, glass and even precious jewels attached to them. If you want a gold faucet, you can have that too! Whatever your style and budget, we can service your faucet needs and help guide you in the selection process and get you the best faucet for the application. Is the body of the faucet brass? This will last longer than plastic. Is the manufacturer a reputable one? Is this a style I can live with for the next 5-10 years? Does the faucet fit the existing holes drilled in the countertop (this one only applies if you are not replacing your tops)? Is it easy to turn on and off (especially for elderly)? Is the finish one I will not get tired of? Is the finish a PVD finish or warranted? We offer many manufacturers and would love for you to browse the few sites we have attached. Whether it is a kitchen faucet, bathroom faucet, shower or bath, the options are endless in today's market.